Hundreds of users of the rheumatoid arthritis drug, Actemra, have died while taking the medication. Law firms are prepared to take legal action for compensation suits. The FDA is considering regulatory actions. Critics say the drug’s manufacturer, Genentech, should have warned consumers about the risk of heart problems, stroke, pancreatitis, lung disease and other problems. On its label, Actemra warns patients that the drug may increase a person’s risk of developing serious infections, such as tuberculosis. It also cautions users about the possibility of stomach or intestinal tears and other side effects. But investigative reports suggest that manufacturer Genentech may have failed to adequately warn patients and doctors about additional serious complications including heart failure, heart attack, stroke, pancreatitis, lung disease and death. The revelations could pave the way for lawsuits against the drug’s maker. 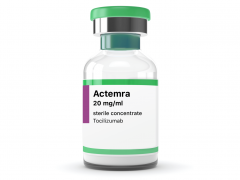 Signs of trouble with Actemra (tocilizumab) first made headlines in 2009, when Chugai Pharmaceuticals, a Japanese company that originally developed the drug, reported 15 deaths among 5,000 patients who’d taken the drug for rheumatoid arthritis. The company also reported 221 adverse reactions among users. And a Chugai spokesman told The Wall Street Journal that the company could not rule out a “causal relationship” between the drug and the deaths. At the time, Roche, the Swiss pharmaceutical giant that includes Chugai and Genentech as subsidiaries, downplayed the reports. A company spokesman said the death rates were consistent with the number of fatalities you’d normally see among patients with rheumatoid arthritis and were in keeping with death rates of patients taking other biologic drugs. But safety concerns heightened in 2017, when an investigation by Boston-based STAT news reported that more than 1,100 patients in the United States had died while taking Actemra. STAT’s investigation found that hundreds of people using the medication died from heart problems, lung disorders and strokes. Thousands more suffered other serious side effects. The news organization analyzed more than half a million side effects reported for Actemra and other RA drugs, such as Enbrel, Humira and Remicade. It found that the rate of complications was “as high or higher” for Actemra when compared to its competitors — yet, patients were never warned about the potential risks. Other RA drugs do contain warnings about the risk heart and lung problems. U.S. Food and Drug Administration documents obtained by STAT under a Freedom of Information Act request show that government regulators were aware of these potentially fatal side effects during post-marketing surveillance of the drug. But in most cases, the “serious, unlabeled adverse events” could not be conclusively linked to Actemra. A 2013 report from the FDA’s Center for Drug Evaluation Research and Therapy acknowledged 91 reported heart attacks — including 21 deaths — among patients taking the drug. The report even noted that some of those heart attacks had occurred while patients were getting the drug administered, or shortly thereafter. The report also noted that the medication can cause an increase in cholesterol levels “which may contribute to the risk of cardiac events.” But because the patients had other risk factors for a heart attack, including obesity, high blood pressure and smoking, it could not conclude that the drug was the cause. Recent studies have also raised concerns about serious side effects not included on Actemra’s label. In a 2016 study in the Journal of Clinical Pharmacology and Therapeutics, German doctors described the “first well-documented case” of tocilizumab-induced acute pancreatitis. Pancreatitis is a serious inflammation of the pancreas that can be deadly. The physicians said a 40-year-old patient taking the drug had developed upper abdominal pain and other clinical signs and symptoms of acute pancreatitis over the course of two days. The man improved, however, when he ceased taking the medication. The doctors concluded that tocilizumab was the “probable” cause of his pancreatic inflammation. Looking at the FDA’s FAERS database and other studies, the physicians found 55 other cases of acute pancreatitis associated with the use of Actemra. They concluded that more studies should be performed to “confirm and quantify” the risk and that doctors “should be aware of the probable association” between Actemra use and acute pancreatitis. A 2013 report from the FDA’s Center for Drug Evaluation and Research recommended “continued monitoring” of Actemra for several “potential safety issues,” including reported cases of pancreatitis, liver damage, blood clots and low blood counts. In January of 2018, the FDA announced on its website that it was “evaluating the need for action” because of adverse event reports involving Actemra and cases of pancreatitis and liver damage. Six months later, the agency stated it was considering regulatory action of Actemra — and four other drugs that inhibit Interleukin-1 and Interleukin-6 — because of adverse reports of serious lung problems among patients. The reports included cases of pulmonary hypertension, interstitial lung disease, and a rare, potentially fatal disease called pulmonary alveolar proteinosis, or PAP. An October 2018 search of the FDA Adverse Event Reporting System revealed 27,858 adverse events associated with Actemra. The FDA deemed more than 21,000 as serious cases. At least 1,821 involved death. The cases included 1,784 cardiac disorders, more than 6,000 gastrointestinal disorders and more than 4,000 respiratory reactions.